iFi Audio are nothing if not consistent. That’s the kind of first review sentence that normally has most readers rolling their eyes - don’t lie, we saw you do it - but we use it deliberately. Their design aesthetic is utterly resistant to change, modern aesthetics, or flair. Their DACs and amps and weird USB gizmos all adhere to same nerdy looks, and all are festooned with opaque jargon and strange switches. But in the nano iOne, a Bluetooth DAC designed for desktop use, there is a surprising spark of life. In this review, we break down the nano iOne’s sound, design, packaging and accessories, specs and more. To see how it stacks up, see our list of the best DACs. Perhaps we should start by talking about what the iFi Audio nano iOne is. Unlike many DACs, it adds a still-relatively-uncommon weapon to its arsenal: Bluetooth. There are plenty of models that have tried this – Arcam and Audioquest come to mind – but discrete digital-to-analog converters are still rooted in the world of cables and wires in separate components, and it’s actually quite rare for audiophiles to opt for Bluetooth signal. We are all in favor of not only making things easier and relying less on timely cables, but also in products that squeeze the compressed Bluetooth signal for everything it’s worth. The nano iOne does both. It must be said that there is a very tiny difference between the quality of the Bluetooth audio, and that of wired audio when using this as a traditional DAC. Although this takes high-resolution aptX audio, which is always good to see, and which we made good use of, it still can’t beat wires just yet. Again, the difference is subtle – so subtle that we almost missed it first – but it’s there. However, that’s just Bluetooth, rather than the DAC itself. So, it shouldn’t necessarily count as a negative. And the Bluetooth signal is solid, with zero dropouts and a good range - we got to around thirty feet before things got wonky. It pairs up exceptionally well against other Bluetooth DACS, like the AudioQuest Beetle (full review here) - identically-priced to the iOne, at $199. The Beetle doesn’t have as many inputs and outputs as the iOne, but offers slightly better sound quality. However, in terms of Bluetooth, you won’t find significant differences between models - these days, DAC quality is good enough that you can make your decision based on other factors. DACs are subtle. We know this. They are often so subtle, the act of converting digital signals to analog ones is so subservient to the actual amplification, the debates still rage about whether they make any difference at all. We are firmly of the opinion that they do – as anyone who has ever listened to the Benchmark DAC3 HGC (full review here) will tell you – but the nano iOne definitely isn’t going to win the argument on this one. If we had to pin the sound down, we’d say that it’s reasonably bright and balanced. It offers a clear, concise picture of exactly what’s going on with the audio quality, sharpening it ever so slightly before passing it over to the amp. No matter what input you choose, the overall impression is one of smooth competence, with little if any dramatic effect on the sound. The DAC packs in a Burr-Brown converter chip, a brand known for its quality, and it does the job well. It’s not only able to handle up to 192kHz of standard PCM audio - your average Spotify stream, for example – but also DSD and DXD audio, if you’ve got a specialised player that can deal with it (here’s an explainer, if you don’t know what that is). It must be said that DSD on this thing sings. It’s where we noticed the greatest impact of the smooth conversion, which felt like it gave the audio just a tiny little bit of a lift where it counted. There’s also an ultraprecise clock system embedded in the machine’s guts, although its effect is the kind of thing that you only notice if something went wrong. Still, nice to have. Comparing this with other DACs, it’s clear that most of the difference is in functionality, rather than sound. For example, the aforementioned AudioQuest Beetle does similar duty as a Bluetooth hub, and offers similar sound quality without offering as many input and output options. Then again, the Beetle has a much smoother and more distinctive design. But if sound quality is what you’re after, then you could quite happily choose either one. As it is, the audio of the nano iOne is like the design: it gets the job done, with minimal fuss, and a lot of functionality. It’ll never beat a model like the high-end Arcam irDAC II, which really does make a dramatic difference to the sound (and has the cost to back it up, at $549 to the iOne’s $199). But we still consider it a strong option if you’re looking for a good-sounding DAC. The same could be said for these selectable filters. One is labelled Listen, and it’s designed for…well, listening, and the other is labelled Measure, and is designed for taking measurements. What measurements? We have absolutely no idea. What we can tell you is that the Listen filter is very, very slightly brighter than the Measure one. It’s an interesting addition, but a slightly pointless one. If you have a product that is clearly aimed at new listeners, those who might not be entirely sure how all of these things work, then why include a filter with an option specifically devoted to those who do? It’s as if they shoved it in at the last minute, purely because they thought they needed to put something there. Chances are, you’ll play with the filter once, and then forget it exists. We feel the same way with many iFi products, unfortunately - we recently tested their iFi Audio Micro iDAC2 (full review here). That DAC doesn’t have Bluetooth, and is quite a bit more expensive than the iOne, at $325, but it shares the same slightly pointless filters. The iOne is a slightly more user-friendly section of the company’s offerings, designed for those of us who aren't quite ready for something like the massive Pro iCAN amp. What it is, when you take out the basic packaging, is a tiny box roughly the size of a palm. The design aesthetic – slightly coffin-shaped has become something of a company trademark, with the same style seen in products like the micro CAN SE (full review here). Filters and switches on the front, connections on the back, and a whole lot of pointless jargon, instructions, and marketing copy written on the bottom. Our mocking is meant to be gentle. For the most part, this is an exceptionally well-engineered product. Unlike many of the company’s offerings, the housing is made of metal, but the plastic is robust enough to withstand being knocked off a desk, and the build quality feels strong and sturdy. Round the back, you get a simple set of connections: a USB input, an S/PDIF In/Out, and a standard RCA output. Nothing you haven’t seen on a million DACs before. It’s round the front where the interesting stuff is, and this is where, against all odds, the nano iOne shows a little bit of personality. There are two switches, both metal, and both with a pleasing clunk when you flick them – although it’s nothing on what Schiit does with the switches on their apps, like the Magni 3 (full review), which has one of the best activation noises in audio (on second thought, perhaps we shouldn’t be the ones accusing iFi of being nerdy). One switch controls the input, while the other controls a filter that modifies the sound slightly, and which we will go into in a little more detail below. One of the things we can’t quite understand is why the Bluetooth button, which allows you to pair the DAC with the device, wasn’t made into a switch as well. It’s a boring old button, as if the supply of switches in the iFi factory suddenly ran out. Perhaps it’s just to keep costs down, but really, how much more would it have increased the price to add in a third switch? It’s a wasted opportunity. However, the front end does redeem itself, because it has one very cool, very human feature: a big, backlit iFi logo that changes color depending on what input is selected. It’s very cool – and works well, allowing you to figure out the input status at a glance. It’s a surprisingly human touch, and it’s something we hope to see a lot more of in future releases. Beyond that, the DAC functions without any surprises. Things work exactly like they are supposed to. Bluetooth pairing is virtually instantaneous, and we never experienced dropouts. The fun part is figuring out the best way to use the DAC. Sure, it functions just fine on a desktop-based speaker or headphone setup, but it can also be used quite comfortably with a gaming console, a TV, or something like a Google Chromecast. It’s also dead silent, meaning no noises to interrupt your listening. iFi’s accessory game has always been strong. We still remember the surprise when we popped open the iCAN SE packaging to find that they’d included an RCA cable, which is something we’ve still never seen, anywhere. In this case, outside of the wart and power cable, what you get is an included USB cable. Some outlets have grumbled about how short it is, but we think that’s almost absurdly ungrateful. After all, it’s not like most homes are short of USB cables, and it is a Bluetooth DAC. Beyond that, there’s nothing too exciting. It’s a standard cardboard box, which you can dispose of the moment you unwrap it. 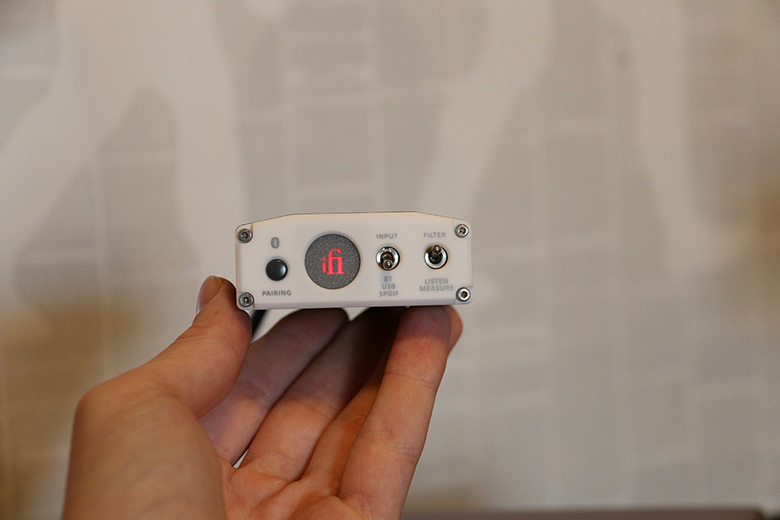 The functionality and build quality of the iFi Audio nano iONE DAC are second to none. The Bluetooth is both handy and faultlessly-executed. ​The sound is smooth and unobtrusive, meaning you won’t get any coloration in your music. The nano iOne’s filter section feels pointless and tacked on. The design of the DAC is still kind of boring, despite the human touches. ​Doesn’t do enough to differentiate itself from a crowded DAC field, especially in its $200 price range. iFi make a great many products, and the most direct comparison with the iOne – or at least, the one we get asked most often about – is the iFi Audio Micro iDAC2. While it doesn’t have the Bluetooth capabilities of the iOne, and it's an older model, it still remains one of the best DACs available. The DSD playback is almost faultless, and although it definitely isn’t going to convince your friends that it’s a key part in the audio chain, you’ll definitely know differently. Be warned: you will pay more for it than you do for the iOne. That model costs $199, whereas the iDAC2 retails for $325. If you want something that costs just ninety-five cents more than the iOne, but does slightly different things, try the phenomenally-popular AudioQuest DragonFly Red. Sound-wise, there are very few differences – we’re talking clean, neutral, balanced audio here. But the DragonFly can definitely do a few things that the iOne can’t, and vice versa. For one thing, the DragonFly is designed to plug directly into the USB port of PC or laptop, and can function as both a headphone amp and a stand-alone DAC. It also has zero controls on it. We’d say that you should go for the iOne as part of a multi-chain desktop setup, and get the DragonFly if you want something more compact. Then again, the price point of just under $200 seems to be a particularly crowded one in the world of DACs. If neither the iOne of the DragonFly are available, or you want something that has the ability to handle MQA audio streams (like those found on Tidal) then we’d suggest you check out the Meridian Explorer2. Like the two models mentioned above, it is slim and subtle, with a sound to match. You can probably avoid it if you aren’t interested in MQA, and it doesn’t have Bluetooth, but it remains a viable alternative. None of the models above match what we think is still one of the best DACs on the market right now: the stupendous Chord Mojo. While it doesn’t have Bluetooth, it’s portable, and has some of the best audio quality we’ve ever heard from a DAC. It’s also significantly more expensive than the nano iOne, at $549 – more than double the latter’s $199 price point. However, if you have the money to spend, then we would absolutely recommend this one. It’s actually quite rare to find dedicated amplifiers for gaming headphones. If a gamer does spend money on amp – as opposed to splurging on screen, mouse, and headset – it’s not likely to be a specialised one.